Garfield Park Conservatory is one of the shining stars in Chicago. It is one of the largest conservatories in the world, and was designed by famed Landscape Architect Jens Jensen, and finished in 1907. It is 4.5 acres inside, and is often called “landscape art under glass”. Until a few years ago, it was left to rust and decay. We would take the kids to walk around the warmth and beautiful plants, especially in the wintertime when it would get dreary and cold outside. The glass was cracked and leaking, steam pipes were leaking everywhere, it was very sad. In 1994, the restoration started, but seemed to be moving very slowly. Around 2000, Maggie Daley wife of the Mayor, took Dale Chihuly to visit, and he arranged a spectacular exhibit in 2002. Attendance soared, and so did restoration. 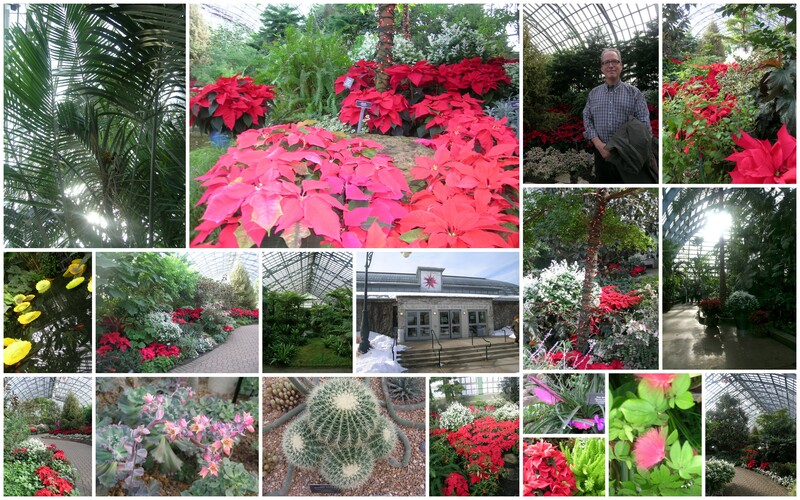 The Conservatory always has special flower shows, and always a Holiday show with poinsettias. It is my favorite time to go there, and this year was no exception. The show runs until this Sunday. I want to take my knitting there this week, and just sit and really take in all of the flowers. Awesome! Thanks for the heads up. I will head there before the holiday show closes.